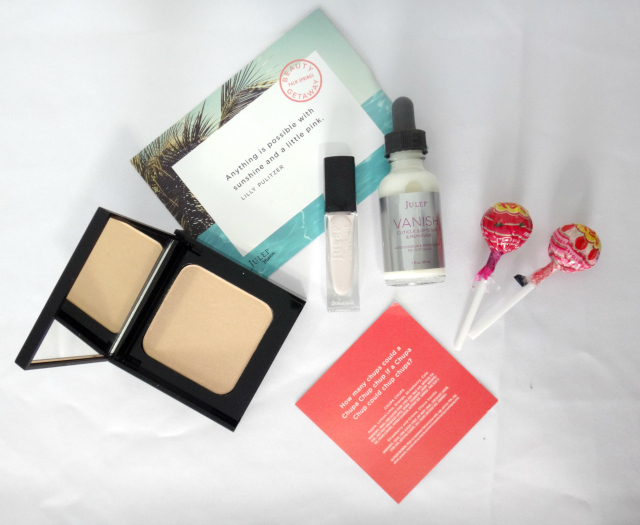 This is my first Julep Maven monthly box (the prior one being a welcome box), I was really excited about it and I wanted to try the complete experience. 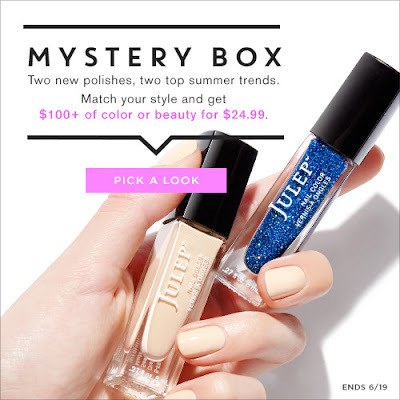 Julep maven chose 3 products for you based on your profile but you can customize your box and swap them for something you like better, so I personalized the box and I also ordered some add ons. And this is everything I received this month. I was going to receive 3 nail polishes but I swapped the other two and I keep lillian-it girl which is a white-rose cream nail polish, I like the color a lot because it isn't too white and I think it looks better for my skin but it's not easiest to apply and you will need two coats to get full coverage. Then I chose the glow highlighting powder, it is a light color and it adds a subtle glow, perfect for every type of makeup. The last product is a vanish cuticle softener and remover ,I used it yesterday and I love it, this thing does its job, it literally made my cuticles disappear only applying a couple drops on the base of the nails. Everyone received two lollipops this month as a bonus item, I was lucky enough to get my favorite flavors! Originalmente yo iba a recibir 3 esmaltes de unas pero solo me quede con lillian-it girl. El color me encanta porque no es un blanco brillante, es mas bien como rosita y siento que ese color le queda mejor a mi tono de piel, lo que no me gusta es que es muy pesado y difícil de aplicar, se necesitan dos capas para obtener un color parejo. Despues elegi el glow highlighting powder que es un polvo iluminador de color clarito que queda muy bien con cualquier maquillaje. Por ultimo pedí el vanish que es un removedor y ablandador de cutículas, justo lo use ayer y es una maravilla, prácticamente desaparece los pellejitos y hace que empujar las cutículas sea muy facil. Ademas como regalito extra, todos recibieron este mes dos paletitas, a mi me tocaron mis sabores favoritos! A metamorphic coat. This shinny pink top coat supposed to change the color of any nail polish, I haven't used it yet but if I like it you will read a review on this soon. Zelda-bombshell, a gold copper-ish shinny polish. I love it, it applies smoothly and you only need one coat to get full coverage. And a I decided to order a mystery cannonball nail polish and I got fifi-it girl, it is almost the same color as lilian but sheer , really really sheer so I didn't like it. Because I ordered 3 add ons I received an extra gift and it was phillys- classic with a twist a beautiful light pink creme. Ademas de personalizar tu caja tambien puedes agregar algunas cosas más a mitad de precio, yo tenía algunas cosas en la mira así que aproveche el momento para comprarlas más baratas. De izquierda a derecha estan, el metamorphic top coat que es un esmalte que supuestamente hace cambiar de color cualquier otro esmalte de unas, todavía no lo pruebo pero en cuanto lo haga les cuento que tal. El siguiente es zelda-bombshell que es de color dorado cobrizo y con mucho brillito, me encanta que solo se necesita una capa para tener buena cobertura, aparte es muy ligero. Por ultimo agregue un esmalte misterioso, y resulto ser fifi-it girl que no me gusto porque es prácticamente el mismo color que lilan pero mas transparente . Como agregue 3 add ons me dieron un regalo y fue phyllis-classic with a twist que es un rosa pastel muy bonito. I like my box but I was expecting to get some fun color nail polish with my mystery add on or maybe with the gift now I have a bunch of pastel- neutral nail polishes. What do you think about my june julep maven? Mi nueva caja me gusto mucho pero esperaba recibir más variedad y color con mi esmalte misterioso y el regalo que aunque son lindos todo lo que tengo son esmaltes color pastel. Que les parece mi julep de junio? Remember that you can try this subscription for FREE. Just pay $2.99 for shipping. There are three options available : lipstick welcome box ($62 value) , summer brights welcome box ($62 value) and june birthstone welcome box ($58 value). Recuerda que puedes recibir la primera caja gratis pagando solamente el envio de $2.99. Hay tres opciones disponibles: lipstick welcome box ($62) , summer brights welcome box ($62) and june birthstone welcome box ($58). And if you're already subscribed don't forget to buy this month's Mystery Box! 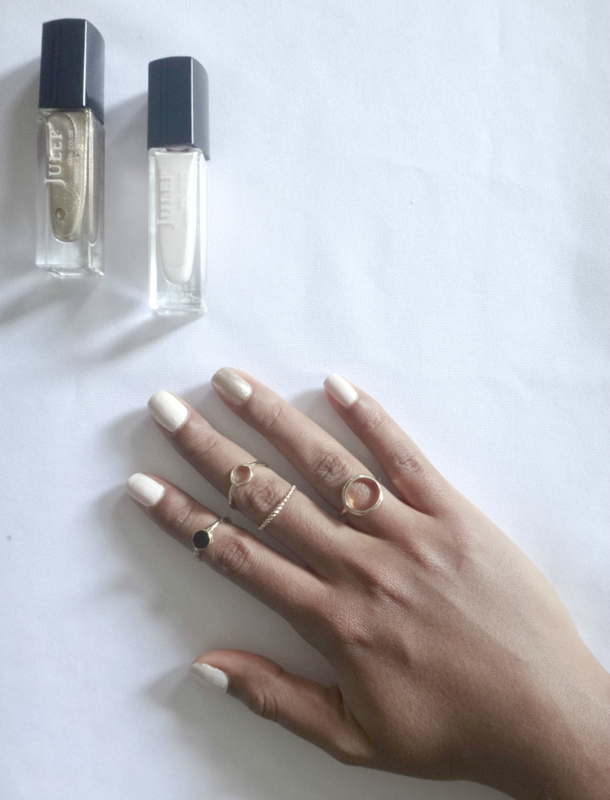 This time you can decide if you want all nail polish or all beauty products in your box. Get your June Mystery Box for only $24.99, but get it quick! This offer ends June 19 or while supplies last. Y si ya estan suscritos, no olvides comprar la mistery box de este mes. En esta ocasión se puede elegir entre la que es de esmaltes de unas solamente o de productos de belleza. Tienen hasta el 19 de junio para pedirla o hasta agotar existencias. Yo ya pedi la mia! *This post contains affiliate links which means that I'll may receive a compensation if you click on them/ Este post contiene links afiliados lo que quiere decir que tal vez reciba algún tipo de compensación al dar click en ellos.